Excitement is almost at fever pitch now that we’re getting nearer to next week’s Samsung Unpacked event where the Galaxy S3 (S III) will finally be unveiled. Along with the iPhone 5 this has to be the most highly anticipated smartphone of the year. We have all the details for you of world times and also live streaming so that you can keep up with all the news of the Galaxy S3 event as it happens. Firstly in case you’d missed the recent news, the Samsung Galaxy S3 event will be held in London on Thursday May 3. Invitations sent out show the event begins at 19:00/7pm GMT but if you want to know the time for wherever you are in the world so that you don’t have to miss a thing then read on. We’ve entered the event time details at timeanddate.com and you can see the event announcer with cities across the world and the time of the event in those places. For example you’ll see that in New York it takes place at 2pm while in San Francisco it’s 11am. In Paris it will be at 8pm, Johannesburg 8pm and New Delhi 11:30pm. Please note that in all of these cases times are for Thursday May 3. However because of the time difference in some cities it will be Friday May 4. These include Hong Kong where it will be 2am, Sydney 4am and Tokyo 3am, all in the early hours of Friday. You can see a section of the event times below this story and for the complete look head to the previous timeanddate.com link. Meanwhile you can also follow the event with live streaming. On the Samsung invitations it states that live streaming will be available at www.facebook.com/samsungmobile. There will also be live streaming available at www.TheNextGALAXY.com. 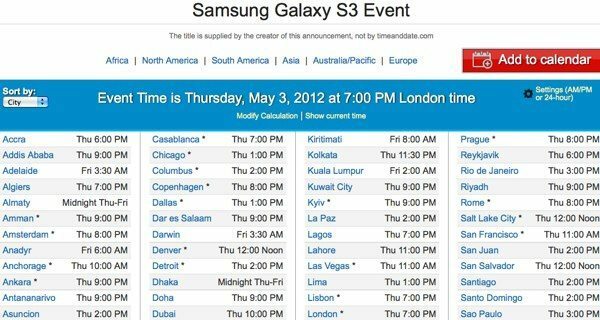 Therefore if you’ve been waiting to hear all the news about the Galaxy S3 smartphone you now know the times and where to go to follow it live. Just in case you’ve not been following the news about what is expected for the Galaxy S3, some of the rumored specs and features include a quad-core Exynos processor (confirmed), a larger display, improved camera, Android 4.0 Ice Cream Sandwich and LTE connectivity so we’ll be closely following the event and of course will be bringing readers all the details. We’d like to hear your comments about the Galaxy S3 event and what you hope to see on the next Galaxy S phone? Have you already made up your mind that you’ll be purchasing the Galaxy S3 or is there a must-have feature that you’re waiting to see confirmed. Let us have your comments. Wait. The S3 releases on Friday in UK but somehow it gets to India first because it says Thursday. And yes, I do know my timezones. the cost would be the main factor, i just waiting for the s3 launch so i can get the s2 skyrocket at a cheaper price!